My son’s new favorite book is “The Vole Brothers” by Roslyn Schwartz. He is 3 and the book has become a minor obsession. The words “The End” should actually read “Again! Again!”. We have not owned a book yet that gets such an enthusiastic response. The pure joy he exudes when we read the book is infectious and I am more than willing to read and reread it at bedtime. Such a sweet thing. Ah the calendar flip! How does this happen? Every year we get a brief splash of orange and black just before we get bombarded with green and red. But with the change in seasonal palette we also get new opportunities for growth. The National Novel Writing Month has started and you can practically hear the creativity crackling through the air. I’ve modified the concept of writing a novel in one month to create a Seuss inspired children’s book this month. The first day. I started, like I do most things in my life, with careful research into strange language. Anapestic tetrameter. I know. It sounds like a disease. It is the academic, super smart way of describing the Seussian rhythm behind his mad rhymes. After an hour or so of trying to figure out how I could figure out if a syllable is stressed or not, I just started writing. I learned something today. I really don’t understand the language of describing language. C’mon! Anapestic tetrameter? Be serious. This doesn’t make any sense to me. But when I forget about all that stuff and feel the thump thump bump of the books I love, it all starts flowing. I also couldn’t find an antecedent if I stabbed myself in the eyeball with one. Most of that English class stuff I learned for the exam, but most of everything I know about grammar, usage and structure, I know by feel. It either sounds right, or it sounds wrong. I learned by repetition, and some patient editors, to sense the difference. 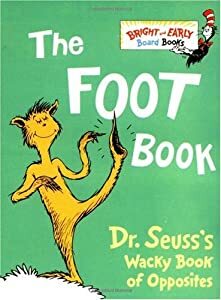 This blog takes its name from a line in Dr. Seuss‘ “The Foot Book“. I love that book as I do with most things Seussian. 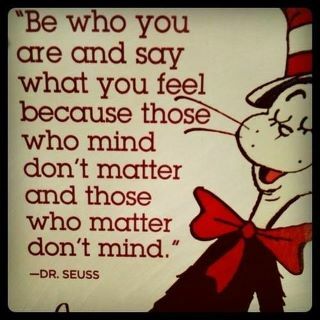 Like many of us, I grew up listening to the meter and rhyme of Dr. Seuss books. There is a spark of magic contained in those stories. Learning the value of sharing, gratitude and generosity are the subtext of many of Seuss’ works. They are a favorite during story time at our house. Back to Seuss! I’ve been writing poetry for a while now. It is always a gutsy thing to say “I’m a poet”, because it pushes you out on the plank of labels and judgement. (“Arrrrr! So you think you’re a poet, aaay? Recite something witty and charming or you’ll be walking the plank, lassie!”, says Captain Critic, Pirate of Poetry.) So I’ll just say that I write poetry and sidestep all that other stuff. I write free-form poetry that just sort of flows out of my heart and onto the page. I do my best to stay with the spirit of the poem so rarely pay attention to meter and I never rhyme when I’m writing. But lately I’ve been thinking of writing a Seuss inspired children’s book, and I’m faced with the structure of both meter and rhyme. While I love to torture my husband with my awful white-girl rapping (I Love You Missy Elliot! ), I’m considerably challenged when it comes to rhyming in poetry or other writing. Rhyming reminds me of trying to complete English homework in grade six. It was excruciating back in those days to be creative. Mainly because I was trying to get an A and not listening to the calling of my heart. To any teachers out there who encourage your students to listen to their hearts, God Bless You (or the metaphysical being of your choice, please shower this person with lucky charms or bazillions of dollars). Still, I am intrigued by the challenge of a project like this for a number of reasons. Besides improving my rapping talent, it will push me to delve into a style of writing that I have not explored since junior high. Also, reading to my son has made me aware that the book I want to read to him hasn’t been written yet. Based on my nearly non-stop consumption of spiritual and metaphysical books, I have particular ideas about what messages we want to tell our kids. On top of that, our kids often don’t need to be told some things that parents do. Things like “You are a strong and powerful person”. Kids, particularly small kids, usually have no sense of themselves as inferior to anyone else. When I tell my son he is a great kid, he usually says “Yeah, great kid” in a tone that says, ‘yeah I know, tell me something I don’t know’. So since most books I read to him I want to rewrite, why not write my own? I’ve been thinking about the National Novel Writing Month challenge, but perhaps I will have my own challenge. A month of writing like Dr. Seuss. Instead of writing a novel of 50,000 words, I could write a children’s book of 1,500 words. I did some research and Dr. Seuss books are longer than the average early reader books that are published now. So since my muse is Seuss, I’ll stick with his format. I figure since I am rhyming and following a set structure it will take about a month to finish writing. 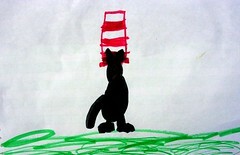 I might also get brave and try some illustrating too, which is another thing I haven’t done since junior high. Yikes! Look at me jumping off the high dive!